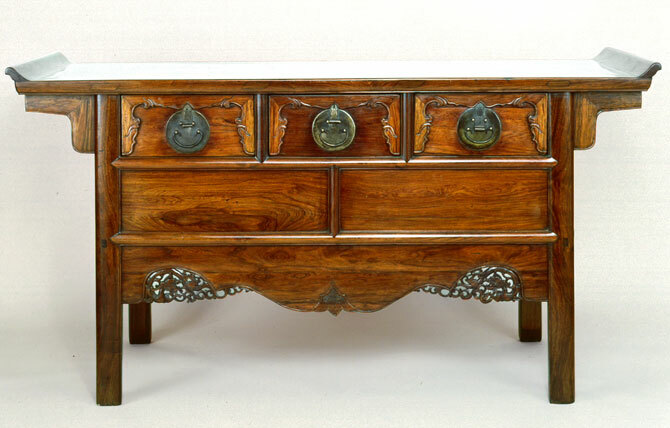 AN EARLY QING DYNASTY HUANGHUALI WOOD THREE-DRAWER ALTAR COFFER WITH DRAGON DESIGN. Provenance: Museum of Classical Chinese Furniture, Renaissance, California. A very similar but slightly longer altar coffer of this style with square face plates and rectangular-shaped bail handles is illustrated in R.H. Ellsworth’s Chinese Furniture, Plate 60. In her commentary on altar coffers and their origins, Dr. Sarah Handler writes on pages 172 to 175 in Ming Furniture In the Light of Chinese Architecture the following: “Wang Shixiang has pointed out an even earlier possible predecessor to the coffer. A depiction on the wall of a Yuan dynasty tomb in Wenshui, Shanxi, shows a cabriole-leg table with drawers and high horizontal stretchers on all sides. If a secret storage area were added between the stretchers and drawers, the table would be a coffer. The only known early depiction of what might be a coffer is in a late Ming woodblock illustration in Lu Ban jing (The Classic of Lu Ban). It shows a table that has a panel below the drawers and a standard apron and spandrels. It is impossible to know whether or not there is a hidden storage area. Like the buildings with a courtyard house, the three-drawer coffer is a low horizontal structure. Its basic framework resembles pillar-and-beam construction and like the outer pillars of a building, its legs slant inward and taper upward. The general term used by twentieth-century cabinetmakers for coffers with concealed storage areas is menhuchi. They may be further distinguished by the terms lianerchu and liensanchu according to whether they have two or three drawers. Coffers are also called dowry chests, jiadi, and were carried in the marriage procession to the bridegroom’s house. This three-drawer coffer with dragon motifs has a particularly deep apron with a bud motif in the arch and its lower edge defined by bold sweeping curves. Tucked into the deepest curves are carvings of spirited coiling dragons in an openwork design that extends along the edge of the apron. The openwork allows light to penetrate and is a pleasing contrast to the solid panels above. The wood used to fashion this piece is of the finest quality with evocative grain patterns enlivening its surfaces. The two panels concealing the hidden storage compartment are cut from the same piece of wood and, like a landscape hand scroll, form a continuous flowing and eddying pattern.